The mongoose may not be the first animal that comes to mind when we think of lucky charms but according to Tibetan Buddhism, this little fox-like creature is a symbol of great prosperity, and thus Mongoose Casino was born. The team at OnlinePokieGame has thoroughly tested Mongoose Casino and its online pokies offering to see if this is indeed a lucky site – read on to find out more. Mongoose Casino is an instant-play site, which means you can play directly over your Web browser with no downloads required. It also provides the option of playing for free in practice mode, so you can head straight to MongooseCasino.com and start sampling games risk-free to see if this is the right casino site for you. To play for real money, click here to sign up for an account and then go to the deposit section to select your payment method and follow the prompts to complete your transaction. All deposits at Mongoose are processed instantly, so you can start playing your favourite online slots or other casino games for the chance to win real cash from the comfort of home with no delays. 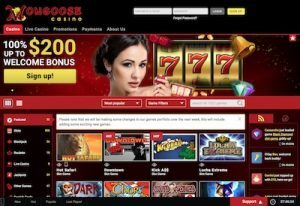 In addition to several ongoing promotional offers (like a cash back offer, birthday bonus and loyalty rewards program) Mongoose Casino also presents a couple of excellent welcome bonuses to entice new players, along with a very rare no-deposit bonus which you claim without having to lay down any money of your own. 20 Free Spins No-Deposit Bonus – Available only to players from Australia, UK, New Zealand, Canada, Sweden, Finland and Norway, Mongoose will credit your account with 20 free spins just for signing up for an account. $200 Welcome Bonus – Make your first real money deposit and Mongoose will reward you with a 100% matched deposit bonus capped at $200. We like these bonus offers because they’re nice and concise, while still presenting a great way for new players to experience real money play without having to hand over as much of their own money. However, the welcome bonuses come with a 40X wagering requirement which is on the higher end of the play-through requirement scale. Mongoose is a multi-provider site hosting online slot games from some of the biggest names in gaming software. All up there are over 800 pokies to choose from, but players from all countries may not be able to access games from certain software providers (like Microgaming and NetEnt) due to region restrictions. Smaller collections of pokies are also available from software developers like Playson, Iron Dog Studio, Oryx Gaming and several others. You also have the option to search by game theme, which can be helpful if you’re looking for a certain type of slot game, like fantasy or old-school. Does Mongoose Casino have mobile pokies? For mobile players, Mongoose also offers a portable platform compatible will all major smartphone and tablet makes and models. The mobile site is arguably even more user-friendly than the desktop site, offering over 440 online pokies available with the tap of your touchscreen. The Mongoose mobile casino is also an instant-play site, so you don’t need to download any apps to play here. All transactions at Mongoose are protected by 256-Bit SSL digital encryption security which is amongst the highest form of digital security available, so you can rest assured your payments are well protected. Withdrawal options are the same as above except don’t include Paysafecard, Flexepin or Instadebit. For the deposit and withdrawal limits attached to each payment method and for a list of payment options available to players in your country, sign in to your Mongoose Casino account and go to the deposit section for a list of options. Alternatively, speak to a customer service rep for more information about the options available to you. The casino has a nice detailed FAQ section so if immediate customer service isn’t available chances are you can find the answer you are looking for within this section. Is Mongoose Casino recommended for online pokies? While the Mongoose Casino interface could do with a bit of an update, overall this is a great, reliable online casino site offering hundreds of popular online pokies in a safe environment. The casino is licensed by the Government of Curacao (Curacao eGaming) which means the casino must run in line with strict laws and regulations, and new games are added regularly, making Mongoose Casino a solid choice for online players. Sign up at Mongoose Casino today to claim your 20 free spins no deposit bonus and see what this casino site is all about.